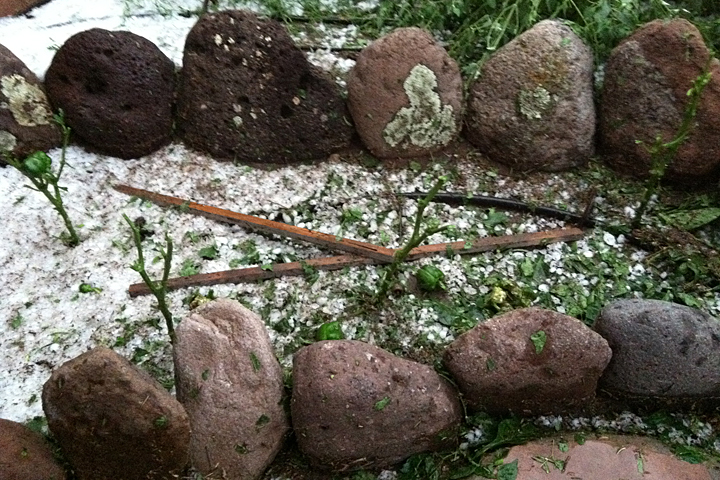 THE 2013 MONSOONS BEGIN RIGHT ON SCHEDULE: RAIN, HAIL, AND FLASH FLOODS! An intense afternoon thunderstorm bearing down on Turtle Rock and the Casitas, completely obscuring the view of the towering Piños Altos Mountains in the Gila Wilderness behind. 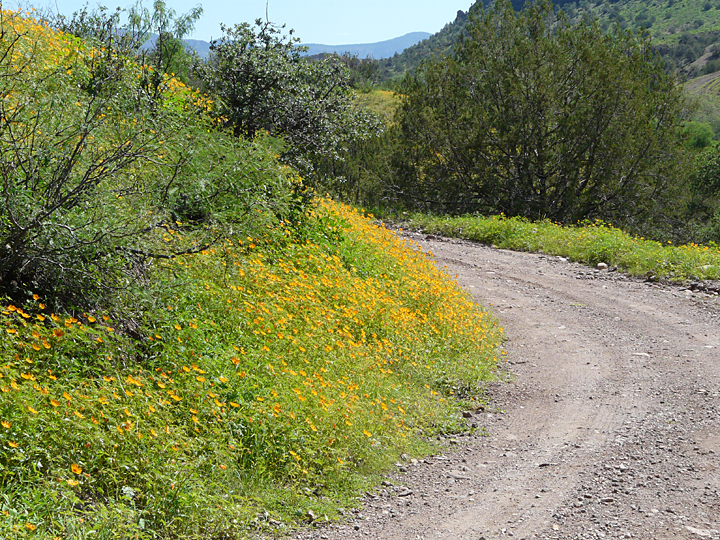 The Dry Season, the typical climate at Casitas de Gila Guesthouses during April, May, and June, is over. On July 1st the Summer Monsoon rains arrived in Southwest New Mexico right on schedule, with a respectable 0.67 inches being measured here at the Casitas. It was the first significant rainfall since March. So far, the total for the month through the third week in July here at the Casitas stands at 4.08 inches, a number that portends a strong Monsoon Season for 2013. As is typical for Monsoon rains here in Southwest New Mexico, almost all of this July precipitation has been as brief showers, plus a few more-intense thunderstorm events, occurring on 12 separate days. For 11 of those events, precipitation was typical, ranging from .04 to .45 inches, and averaging about 0.2 inches per event. Most of the events were of short duration, less than 20 minutes, which is also typical for the Monsoon rains here in Southwest New Mexico. 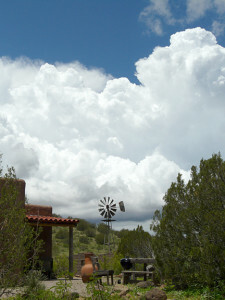 Afternoon thunderheads rising to the north above Casita de los Arboles. The day started out clear and bright with a nice breeze out of the Northeast. By early afternoon the thunderheads began to rise above the Piños Altos Mountains in the Gila Wilderness, five miles north of the Casitas, a common sight this time of year. By late afternoon, though, it was noticed that one could no longer see the mountains in the Wilderness as heavy rain was falling in the Bear Creek drainage, between the mountains and Bear Creek. Watching thunderstorms move around on NOAA weather radar and speculating as to whether your area will receive some rain from it is a great spectator sport here at the Casitas during the Monsoons. And this day was no different. After a considerable time of monitoring the storm’s slow progress towards the Casitas, one’s analysis vacillated every few minutes from “Yes, we will!” to “No, we won’t!” to “Well, it looks like we’ll just catch the edge of it.” Standing outside as the approaching storm entered Horseshoe Canyon (about one and half miles to the north of us), one watched as the dark gray wall of rain slowly advanced towards the Casitas. Then, to one’s deepening consternation, the gray wall of rain turned white and one’s ears perceived a distant, familiar-yet-ominous roaring sound … That was not rain coming. That was hail. 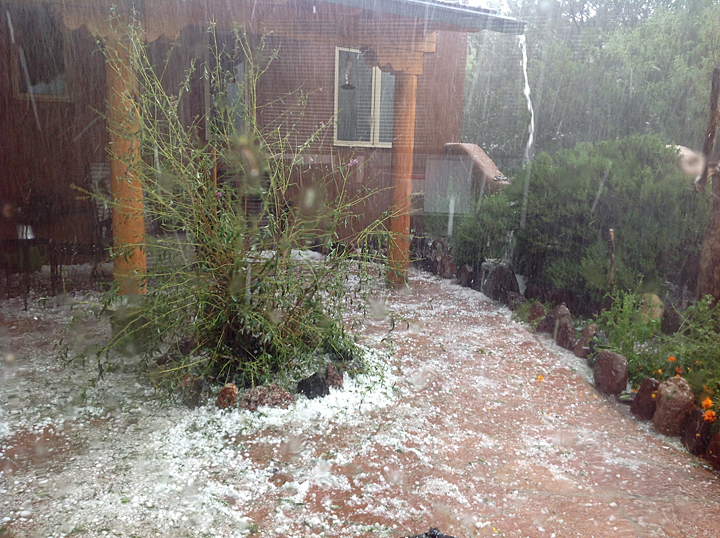 And by the increasing sound of it, it was a massive hail storm that was now bearing down on the Casitas. The porch outside the office, during the hail storm. And what a storm it was! 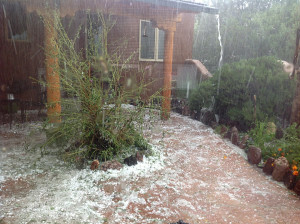 Within 15 or 20 minutes the Casitas received 1.75 inches of precipitation, over half of which fell as large, half-inch to three-quarter-inch hail, driven by 50 to 60 mile an hour winds out of the northeast. Physical damage to the Casitas was minimal and mostly cosmetic, with some chipped paint and one broken window. The plant kingdom, however, was decimated. 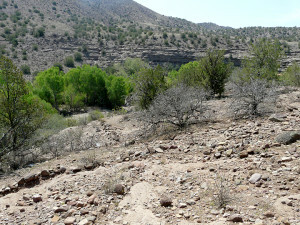 The hardy Honey Mesquite, having just begun to fatten up their annual crop of mesquite beans, was very hard hit with most of the compound leaves and immature beans being stripped from the branches and pounded into the ground. The One-seed Junipers also suffered greatly, with most losing about half of their deep green foliage, stripped off by the hail and left as a deep green blanket carpeting the ground beneath the trees. The Scrub Oaks, at least those that had stored enough moisture during the Spring to put on new leaves, were stripped completely bare. In addition, all ground cover, be it dead grasses or weeds left from last year, or any new growth of green grass or weeds that had struggled to emerge during the dry Spring, was completely obliterated by the pounding hail. With the ground now devoid of any cover, the resulting runoff of nearly two inches of a dense slurry of rainwater and hail completed the devastation by scouring and eroding the ground surface unlike any storm witnessed here during the 15 years we have lived here. 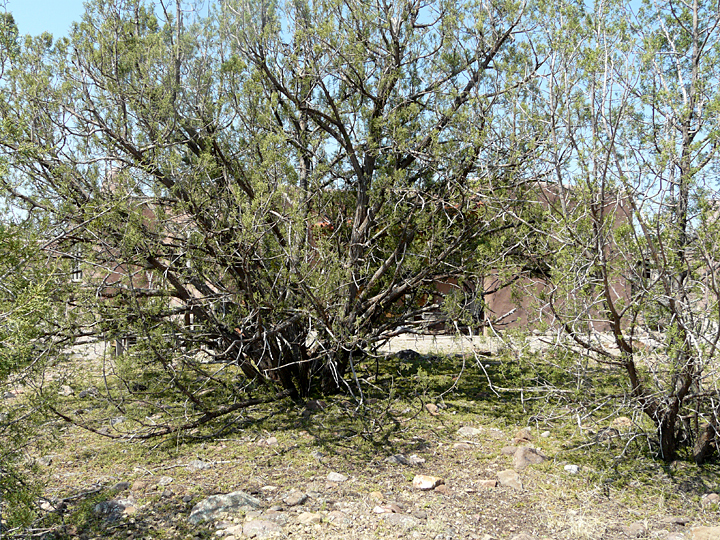 A juniper on the east side of the Casitas, facing the direction from which the hail came, with about half of their foliage stripped from their branches, forming a green carpet under the tree. 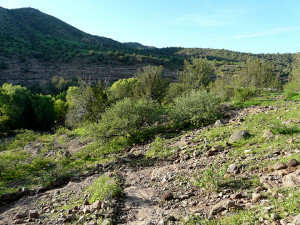 East-facing hillside in foreground showing Honey Mesquite, Catclaw, and Scrub Oak completely stripped of foliage, plus complete destruction of all the vegetative ground cover. About a half-hour after the storm had moved on to the west, the resulting flash flood that traveled down Bear Creek reached the Casitas. It had been over a year since flood waters had reached this magnitude – over 4 feet in depth, covering the entire floodplain bank to bank, and moving at speeds nearing 20 miles an hour. 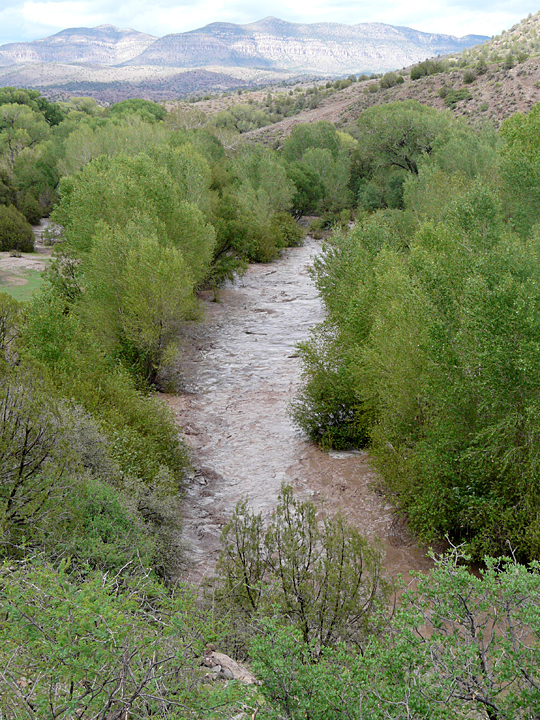 Although a 4-foot flash flood level is fairly common on Bear Creek during the Monsoon Season, there were two factors that set this event apart. First, the water itself was not normal floodwater runoff. Instead, it was a highly viscous, density current slurry of water and hail that resulted in much greater scouring, erosion, and sediment transport within the creek bed than water alone would have done. Second, because of radar monitoring of the storm’s approach towards the Casitas, one knew that the storm had concentrated its fury on several of the canyons feeding into Bear Creek from the Piños Altos Range to the north. Because of the high volume of water and the steeper gradients on these side canyons, vast amounts of vegetative debris had been scoured from these canyons and was carried downstream as a dense debris flow mixture of hail, floating mats of branches, twigs, leaves, and smaller particles, on up to large cottonwood logs, more than sufficient to take out all of the stock-animal water-gap fences across Bear Creek at property boundaries all the way down to the Gila River … After months of slumber, the physical dynamics of the High Desert Landscape had once more roared into wakefulness. Over the last 15 years various attempts at horticulture have been tried at the Casitas. 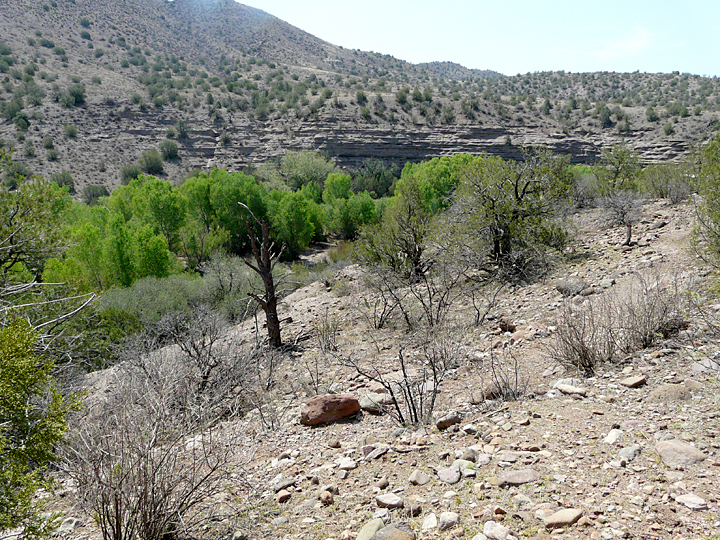 So far, what has been proven is that gardening of any type in the High Desert Landscape of Southwest New Mexico can be a frustratingly difficult challenge. Essentially all attempts to date, and there have been many, have failed for various reasons, including searing drought, swarming insects, foraging deer, tunneling gophers, rampaging javelina, ravenous birds, nutrient-deficient soil, or excessively nutrient-rich soil due to over composting. Determined to overcome failures from previous years, this year two more attempts were made at vegetable gardening at the Casitas. In the courtyard at the office/house a very small garden was planted consisting of yellow squash, a couple of tomato plants, a few sweet peppers, and basil. This garden was basically a scaled down repeat of last year’s efforts, which had included initial removal of the original rocky and nutrient-impoverished soil down to 12 inches depth and replacement with nutrient-rich loam brought up from the Bear Creek floodplain. That garden, while it could be considered somewhat successful since it did produce luxurious towering tomato plants that Jack of the Beanstalk would have admired, and yellow squash leaves the size of a Ringling Bros. elephant’s ears, was definitely not a famine stopper since little or no fruit was produced, due to the over abundant addition of too much of the Casita’s own composed horse manure. Building upon our by now substantial wealth of knowledge-through-failure agrarian enlightenment, this year no compost was added and by the end of June the courtyard garden was off to an excellent start with baby squash, tomatoes, and sweet peppers already forming on the plants. The Bear Creek garden in May, at time of planting. The second garden undertaken this year was carefully designed to be a totally fail-safe garden, one that would implement all 15 years worth of our hard-won knowledge-through-failure experience. This new and improved garden would be fairly large, 20 x 30 feet, situated 6 feet above the active floodplain of Bear Creek on a flat terrace of rich loamy soil that had been built up and periodically naturally fertilized by the occasional exceptionally high floods that occur here every 10 to 25 years. 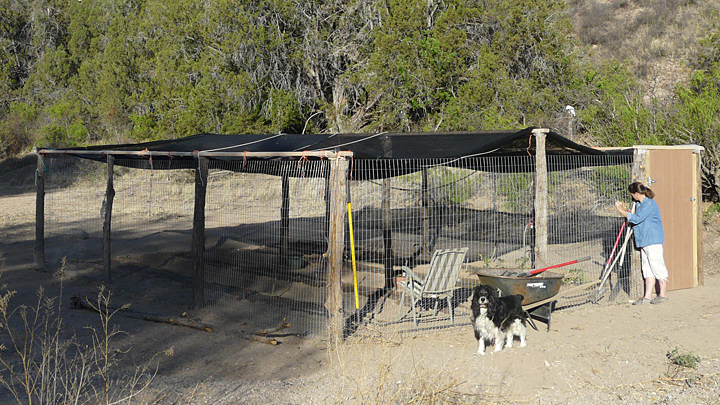 The garden would be fenced with 6 foot high, 2 x 4 inch steel mesh to thwart the foraging deer, encircled with 20 inches of sub-ground-level 1-inch mesh chicken wire to block the tunneling gophers, and extending 16 inches above ground to keep out the baby rabbits, as well as being totally covered over with 50% shade cloth to protect the young plants from the blazing sun and the hungry birds until the Monsoons began. In addition, the garden was also carefully located geologically so that it would not be subjected to strong currents should a 10-year flood happen to occur and submerge the garden for a day or two. To our delight, by the end of June this proof-of-concept garden was well on its way to becoming an agrarian success story. Potatoes, tomatoes, carrots, string beans, snow peas, cantaloupes, large and small watermelons, butternut and delicata squash, and even a test plot of Einkorn wheat, favorite grain of Otzi the 5,300 year old Bronze Age Alpine hunter, were all thriving beautifully, and by July 2, some plants had even started to put out flowers! The Bear Creek garden after the July 3rd hail storm. Everything under the shade cover was pretty well battered, and the shade cover was full of balls of hail which took several days to melt away! Those bare stalks used to be sweet pepper plants in the Courtyard garden, before the hail hit. 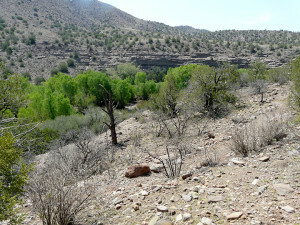 Within a week after the hail storm, new green buds could be seen growing on the mesquite and scrub oaks, and on the ground small shoots of grasses and weeds were poking their heads up everywhere. 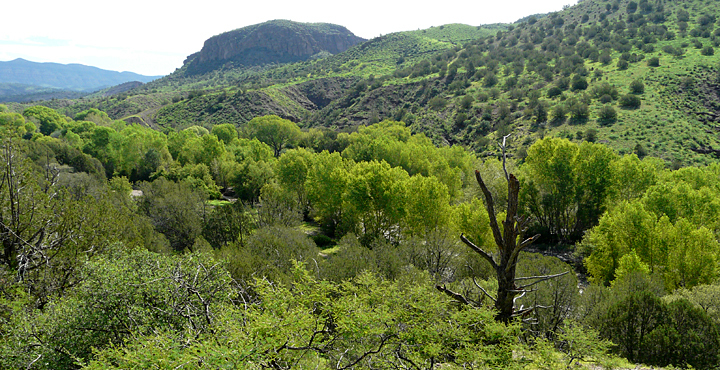 Two weeks after the hair storm all of the smaller mesquites and most of the scrub oaks were now covered in bright green leaves, spurred on by four small rain showers that had fallen at the Casitas during the interim. Perhaps even more amazing was that the ground which had been virtually stripped bare of any living plant or weed by the storm, was rapidly being covered with a dense variety of grasses and weeds. It was if the pounding of the ground by the hail had served to waken and germinate every seed that had been buried in the ground and had laid dormant over several years, just waiting for the wake-up call. Unfortunately, such was not the case for the unprotected garden plants. While a few plants that were only peripherally damaged did eventually manage to stage a comeback, many simply shriveled up and died. Two scrub oaks on east-facing slope three days after the hail storm: all leaves stripped off oaks and surrounding ground vegetation pulverized and obliterated. Same view of two scrub oaks on east-facing slope photographed 16 days after the hail storm, showing amazing regeneration of leaves on scrub oaks and ground-cover vegetation. 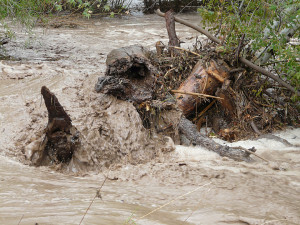 During flash floods, large deposits of logs and smaller vegetative debris collect along the sides of the main channel and across the floodplain, which can be measured later to determine peak water depths. Exactly two weeks after the big hail storm, one was watching the radar as a large and seemingly extremely-intense thunderstorm made its slow journey towards the Casitas from the East downstream along the Bear Creek drainage. Going outside, the sky did look somewhat dark to the east but not all that threatening. By the time the storm reached the Casitas, most of the its energy had dissipated, but it still retained enough moisture to drop about a third of an inch of rain in a brief 15 to 20 minute period as it passed through. “Not much of a rainstorm,” one thought, looking down at the Creek. “It hardly even muddied the water.” It was at least an hour later, while working at the computer in the office, that one’s concentration was intruded by a persistent sound outside the building. Opening the door it was immediately apparent what the sound was: Bear Creek was once again running and it was running very big and very loud! Going to the edge of the cliff and looking down, an impressive spectacle of sound and fury greeted the senses. Obviously, the storm that had been watched earlier on the radar had been quite severe upstream, and had continued to release several inches of rain as it made its way down towards the Casitas. Soon, the flash flood arrived, in full force, with chocolate-colored water now transporting an even greater charge of floating debris, this time with logs up to a foot or more in diameter and up to 10 feet in length. Awesome! It was obvious that the water was much deeper and running faster than the flood following the hail storm, but it was not until the next day when observations down in the Creek showed that the water had been over 6 feet deep, raging across the entire floodplain. 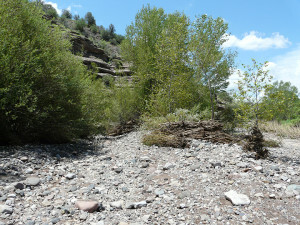 Forced against the cliffs of Gila Conglomerate along its course, the sediment-laden waters of Bear Creek continue the slow abrading. The flash flood of July 17th crested at 6 to 7 feet within the main channel, overflowing its banks and surging across the entire floodplain. As discussed in the June 2013 Nature Blog, during the Dry Season and the run-up to the Monsoons, Bear Creek at the Casitas had gradually shrunk in volume until most of the open water was confined to sporadic shallow pools. Within the creek channel itself, extensive mats of drying Watercress and Duckweed coated everything from broad sand and gravel beds to periodic jumbles of large boulders. And with the passing of two flash floods, the landscape of the Bear Creek floodplain was entirely changed. 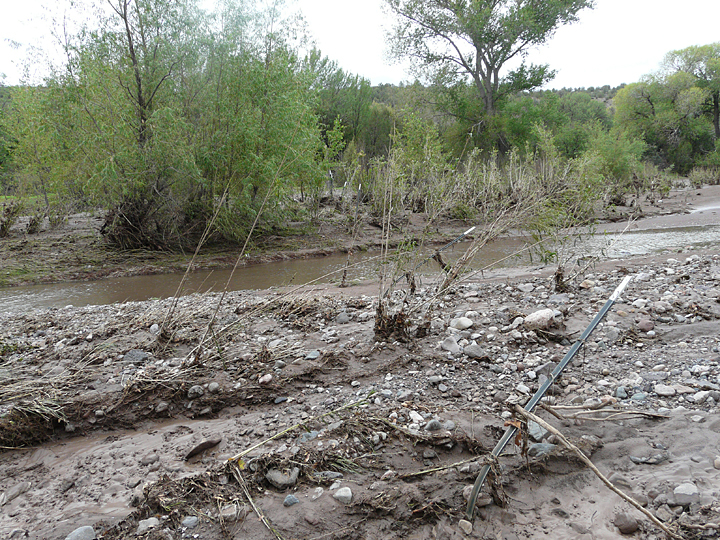 Bent iron t-posts are all that remain of the Casitas’ southern boundary watergap fence. Unless one has the opportunity to witness the occurrence and the aftereffects of a flash flood in the American Southwest, it can be difficult to understand that the stunning iconic beauty of this dry and often barren landscape is almost entirely a product of running water. Each year numerous visitors to the Southwest, along with newly-arrived residents, find themselves in deep and often fatal trouble by underestimating this powerful force of nature. The following photographs illustrate the changes observed along Bear Creek following the July 3 and 17 flash floods. While Bear Creek is not very large, the processes that produce these changes are the very same as those that have carved the Grand Canyon. It’s just a matter of scale, both in magnitude and time. Lag deposit of boulders near the southern end of the Casita property created by extreme turbulence developed when the south-flowing Bear Creek is forced by cliffs of Gila Conglomerate to abruptly change direction and flow to the west. 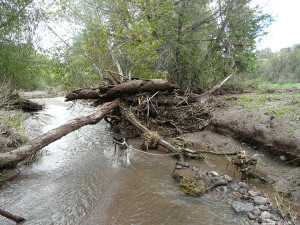 Log jam left at side of main channel of Bear Creek after the major flash flood on July 17th, when waters peaked at 6 to 7 feet above normal flow in the channel. Our dog Bower (center of pix) is 24 inches tall. 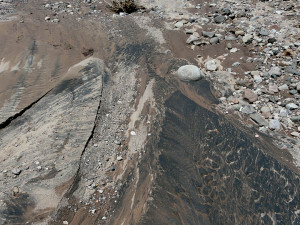 Deposits of heavy mineral sands (minerals with a high specific gravity, such as magnetite, rutile, zircon and garnet) accumulate where the velocity of flood waters is sufficient to selectively remove lower specific gravity mineral sands, such as quartz and feldspar, from the transported sediment. 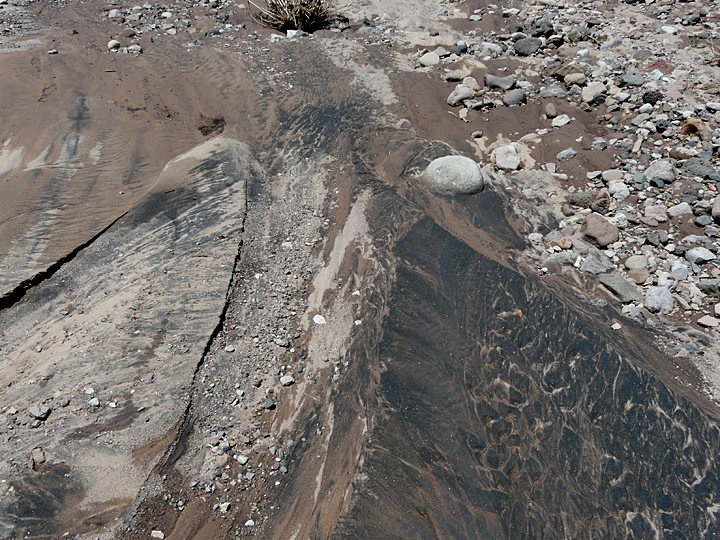 Heavy mineral sands or black sands are sought for and panned by prospectors when seeking placer deposits of gold. 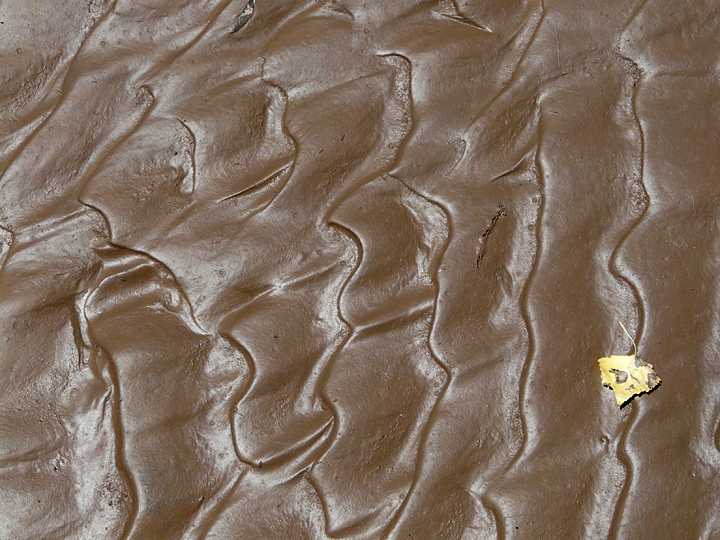 Ripple marks are formed when running water transports sand along the bottom of a creek, stream, or river. 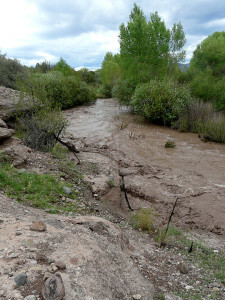 This photo shows that Bear Creek was flowing from right to left. 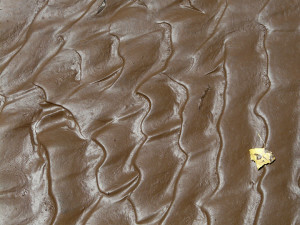 In this case, the ripple-marked sand has been coated with a much finer layer of silt and clay that was deposited as the flood waters receded, transport of sand-sized particles stopped, and fine silt and clay particles settled out of slow-moving to still waters along the creek. The bright yellow cottonwood leaf is about 2-1/2 inches in diameter. People often ask when is the best time to come to see wildflowers. The answer is always: When the rain comes!, as this brilliant hillside of Summer Poppies illustrates. The strong start of the Monsoon Season of 2013 was to continue for the rest of the month, as persistent brief showers and thunderstorms brought welcome relief from the enduring dryness of the previous Winter and Spring months. By the last week of July the rain total for the month measured 6.18 inches, only 0.8 inches less than the Casitas had received for the entire year of 2012 … And in less than a month, the Bear Creek landscape was transformed into an undulating landscape of brilliant green. Amazingly, everything in the office courtyard garden came back with the exception of one tomato plant. Even the sweet pepper plants, which were literally just a stem after the hail storm, have many new leaves and may even produce a pepper or two. Many of the mesquites have regrown their leaves; the scrub oaks are now fully-leafed and beautiful, and the floodplain garden is thriving. 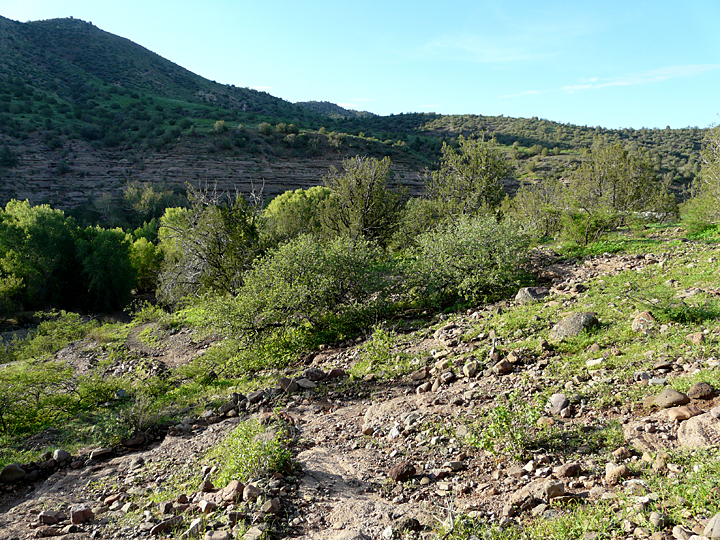 Looking north along Bear Creek canyon at Casitas de Gila Guesthouses, with Turtle Rock and the Gila Wilderness rising in the background. This entry was posted in Bear Creek, monsoon rains, weather and tagged Bear Creek, monsoon rains. Bookmark the permalink.